Sept. 29, 2015, 11:09 a.m.
By Dan Kennedy @dankennedy_nu Sept. 29, 2015, 11:09 a.m.
Mark Henderson is certainly not the first person to launch a hyperlocal website in the shadow of the daily newspaper that used to employ him. Nevertheless, his ideas about how to build the site into a sustainable business are unorthodox enough to merit attention. Henderson, a former executive with the 150-year-old Telegram & Gazette of Worcester, Mass., unveiled the Worcester Sun in August. From the start, the Sun’s content has been protected behind a hard paywall of $2 a week. There are no discounts; if you want to subscribe for a year, it will cost you $104. Once the Sun has attracted a critical mass of paid digital subscribers (Henderson won’t reveal the magic number except to say that it’s well short of 1,000), he’ll add a Sunday paper for $1 a week, perhaps as soon as next spring. Print matters, Henderson says, because that’s still where most of the advertising is. 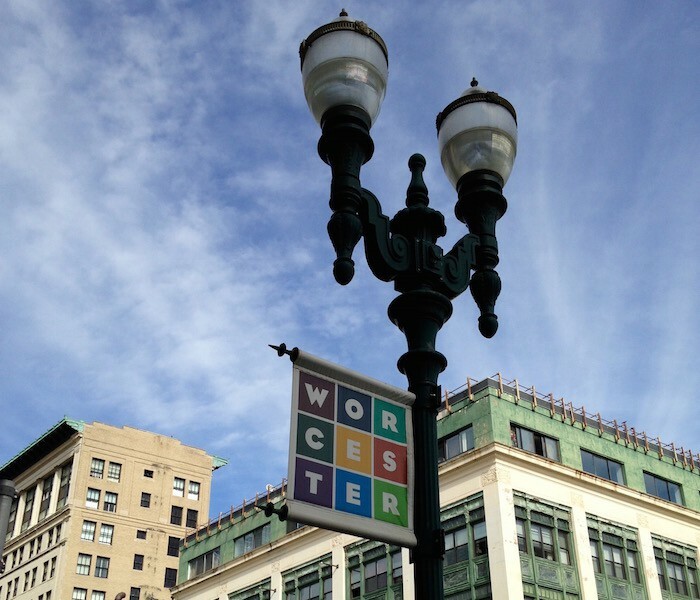 With a population of 183,000 — the second-largest city in New England after Boston — and a median household income of about $46,000, more than $20,000 below the state average, Worcester is a city facing economic challenges. It’s precisely the sort of community that could benefit most from independent media projects such as the Sun, says Catherine Tumber, a scholar with the Dukakis Center for Urban and Regional Policy at Northeastern University. 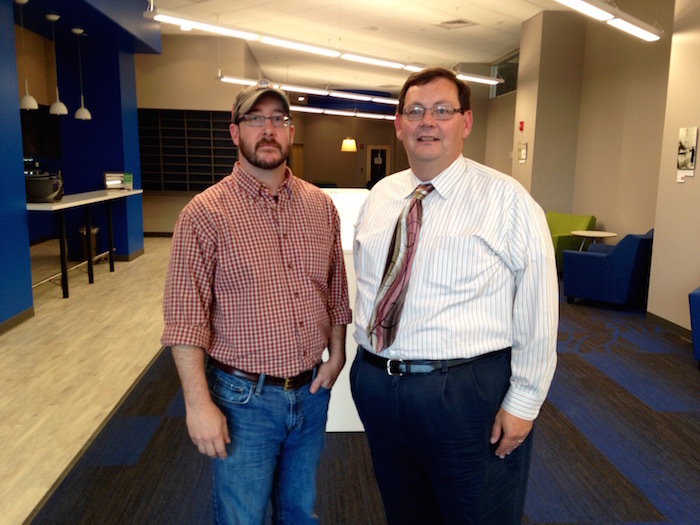 Last week, I met Henderson and his business partner (and cousin) Fred Hurlbrink Jr. in a brightly lit coworking space on the first floor of the Innovation Center of Worcester — formerly the Franklin Street headquarters of the Telegram & Gazette, the daily newspaper where Henderson worked for nearly 25 years. Across the street is City Hall and the Worcester Common. On the other side of the common looms the mid-sized tower that is the current home of the T&G. Henderson, 49, rose from the paper’s sports department to deputy managing editor for technology and, starting in 2009, online director. He left on June 2, 2014, the day that John Henry, who had purchased The Boston Globe and the T&G from the New York Times Company, sold the T&G to Halifax Media Group of Daytona Beach, Florida, after previously saying he intended to sell to a local group. Halifax cut about 20 journalists from the full-time newsroom staff of about 80. Further cuts came a few months later when Halifax turned around and sold the paper to New Media Investment Group, an affiliate of GateHouse Media, based in the suburbs of Rochester, New York. Hurlbrink, 38, had two stints with GateHouse — first as a copy editor at The MetroWest Daily News of Framingham and later at the Design House, run out of the Framingham plant, which handled design and some copyediting tasks for multiple GateHouse papers. In August 2014, GateHouse announced that the operation would be closed and moved to Austin, Texas. Even with a shrunken Telegram & Gazette, Henderson and Hurlbrink find themselves in the midst of a highly competitive media environment. In addition to the T&G, Worcester is covered by MassLive.com, part of Advance Digital; GoLocalWorcester, which has sister sites in Providence, Rhode Island, and Portland, Oregon; and Worcester Magazine, whose parent company, Holden Landmark Corporation, is controlled by GateHouse Media chief executive Kirk Davis but is not part of GateHouse. The Sun’s content so far reflects that philosophy, starting with the August 9 debut, which featured an essay on the city’s bygone newspaper scene by Worcester native Charles P. Pierce, the high-profile journalist and author who these days spends most of his time blogging about politics for Esquire. The Sun has also published stories on the privacy concerns posed by surveillance cameras, the city’s sagging downtown business district, and a mother’s quest to find the educational resources she needs to help her daughter with ADHD. The site also offers such quotidian fare as profiles of local businesses, editorials and, yes, obituaries. The Sun’s paywall — as well as that of the T&G — is based on technology provided by Clickshare, whose website touts the software as a “flexible system” that allows for different types of paid access, billing and payment processing, and various options for e-commerce. Bill Densmore, who founded Clickshare in the mid-1990s, believes that print and digital serve two different types of audiences — and that Henderson and Hurlbrink are smart to try to serve both. Starting and maintaining a community news site is a hard way to make a living, but the allure is undeniable. LION counts about 130 member sites, and of course there many more that are not LION members. New ones pop up regularly. Just this week, The Boston Globe reported on a project called The Spark, cofounded by a former photographer for the GateHouse-owned Enterprise of Brockton. It’s the same allure that has kept Henderson and Hurlbrink going despite setbacks — including a $150,000 Kickstarter campaign that fell well short of the mark. So far, they say, they’ve invested $200,000 in money and time. Soon they hope to unveil the first in a line of ebooks. And they’ve got plans to launch online verticals in areas such as education and local sports. “I think there are places we can go where we can be effective,” says Hurlbrink. If all goes according to plan, they foresee a staff of 20 full- and part-time journalists. The key, adds Henderson, is to fill a niche — and not worry about what the competition is doing. POSTED Sept. 29, 2015, 11:09 a.m.
Kennedy, Dan. "The Worcester Sun wants to bootstrap paywalled hyperlocal digital into a Sunday print product." Nieman Journalism Lab. Nieman Foundation for Journalism at Harvard, 29 Sep. 2015. Web. 23 Apr. 2019. Kennedy, Dan. "The Worcester Sun wants to bootstrap paywalled hyperlocal digital into a Sunday print product." Nieman Journalism Lab. Last modified September 29, 2015. Accessed April 23, 2019. https://www.niemanlab.org/2015/09/the-worcester-sun-wants-to-bootstrap-paywalled-hyperlocal-digital-into-a-sunday-print-product/.